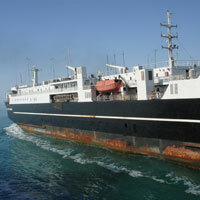 There are no scheduled ferry services between Azerbaijan Turkmenistan (Turkmenbashi) and Kazakhstan(Aktau). When the ferry leaves depends on many factors: weather conditions, how many tickets been sold, loading of cargo and etc. Volcano Travel can assist to you with ferry tickets purchase but cant guarantee exact time of departure from Baku. Usually our managers contact with seaport every hour an get latest information about ferry departure. Sometimes it can take 2 or 3 days so don’t forget to put this time to your travel plans. Try to bring your own food. Journey might take up to 3 days with all the border and customs procedures. Besides, food served on board might not be tasty and could be overpriced.